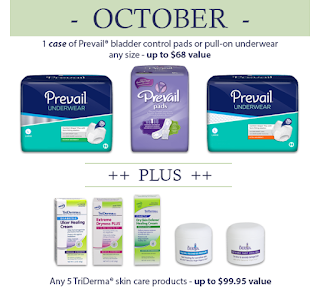 This month’s sweepstakes includes two great prizes from Prevail® and TriDerma®. Read on to learn how easy it is to enter for a chance to win! Be sure to enter our “Helping You Get On With Life” sweepstakes this month for a chance to stock up on absorbent products and skin care supplies — free! The first prize in our bundle is a case of Prevail bladder control pads or pull-on underwear valued at up to $68. Visit this informative Prevail page to learn how No. 1 seller Prevail helps you take back control and maintain your dignity. Known for its many choices, sizes and absorbencies, Prevail will send our lucky winner his or her choice of pull-on underwear or bladder control pads. The lucky winner also receives a set of five TriDerma skin care products valued at up to $99.95. Choices include Facial Redness Repair, Ulcer Healing Cream, Psoriasis Control, Intense Fast Healing, Dry Skin Healing Cream, Eczema Fast Healing, and Protect and Heal. When you use TriDerma MD, you can feel good knowing you’re caring for skin with medical-grade products without the side effects of prescription drugs. Visit our TriDerma page to learn how its formulas provide superior relief and healing for specific skin conditions, all without cortisone or steroids. For a chance to win this month’s prize package, simply e-mail us at info@caregiverpartnership.com or mail a short statement explaining why the prize would be useful to your or a loved one. We’ll accept entries for this prize through Oct. 31, 2015, and will notify the drawing winner the first week of November. Each month, we highlight a family caregiver solution that one winner receives with no purchase necessary and no strings attached. Items we give away are products and services designed to help seniors live more independently and gracefully in their homes. Visit our “Helping You Get On With Life” sweepstakes page for details. Explore other areas of The CareGiver Partnership website to learn more about Incontinence or how to Try Before You Buy.